RUSH: Raleigh, North Carolina, this is Jay. Thanks for the call, sir. Great to have you here. CALLER: Thanks for having me on, Rush. CALLER: I just wanted to touch base with you in regards to what I saw. I went to a Chick-fil-A in Raleigh, North Carolina, today. It took me 20 minutes just to even get my order placed. It was packed full of exciting people and a lot of people there just excited to be there. I've been through that Chick-fil-A a lot. I've never seen it so crowded. RUSH: Let me tell you something. 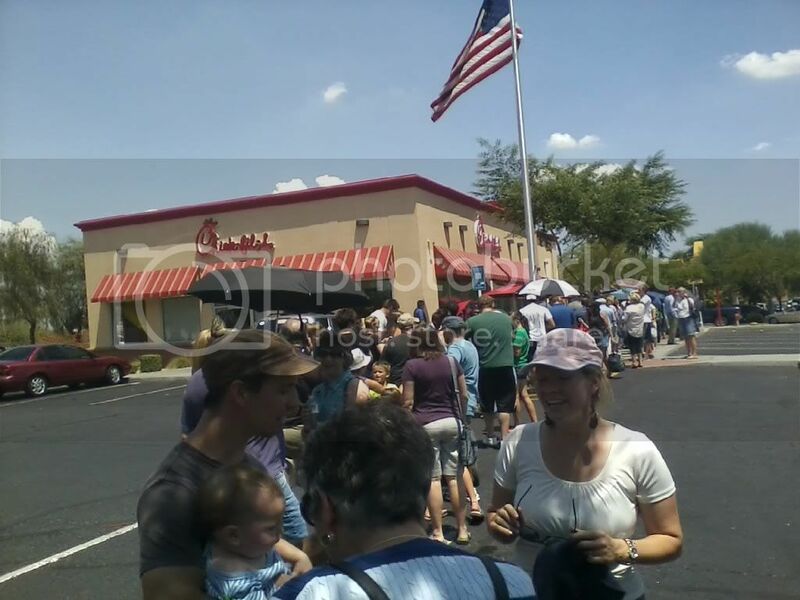 I am being bombarded with e-mail from my website account, the Rush 24/7 member e-mail, with stories just like the one you're telling from all over this country about how crowded the Chick-fil-As are, about how long the lines are. Get this, Jay, I just got an e-mail from a guy who said where he lives, that on the sign at the neighboring Wendy's, it says, "Today go to Chick-fil-A." I don't know where this is, but I'll bet it's not the only example of it. A local Wendy's is telling it's customers, "Today, we think you should go to Chick-fil-A," or something like that. You know, it's happening all over, and it's political. Rahm Emanuel and Thomas Menino, mayors of Chicago and Boston, made this political. And now the people of this country, I'm gonna tell you, you're looking at a microcosm of what's gonna happen on November 6th. You're looking at a microcosm of the Tea Party. You are seeing that great silent majority, or the sleeping giant that our first caller talked about. We have these commercials we do for FreedomWorks, people want to do more than vote. They want to get involved. They want to let everybody know how they feel and in what numbers they exist, and this is the latest opportunity they've got, and they are utilizing it. Literally e-mails out the wazoo today talking about quarter mile long lines. My cousin Andy in St. Louis sent me a picture of a Chick-fil-A in Des Peres, outside St. Louis, of jammed parking lots, traffic jams, people waiting. Other stories about Chick-fil-A someplace ran out of breakfast at nine o'clock and immediately started serving lunch. Now, meanwhile, in Chicago you got the mayor there, Rahm Emanuel, talking about, "Well, they don't represent Chicago values." And a guy in Boston essentially saying the same thing. And Ted Cruz, who was supposedly down by 13 points, coming back and winning huge. Tea Party candidate, in Texas last night, sending a message of generational change to the Republican establishment. Big Tea Party candidate. Sarah Palin endorsed. There is an explosion waiting to happen in this country. People are fed up, and this is a sign. RUSH: I'll tell you what's gonna happen on November 6th, Obama's gonna get Chick-fil-A'd himself. He's gonna get Chick-fil-A'd, and folks, pictures continue to come in, and I'm asking myself, where are the news media satellite trucks today? Where are all the man-on-the-street news reports of this? I wonder if your local news will cover this tonight at five and 11, amidst all the murders and blood and everything else they cover, government corruption. Wait, they don't talk about -- never mind. But I'm just wondering, I mean, this is a major, major event. "The owner of the largest Wendy's restaurants franchise in the world showed his support for competitor Chick-fil-A with a message on some signs in the Carolinas. 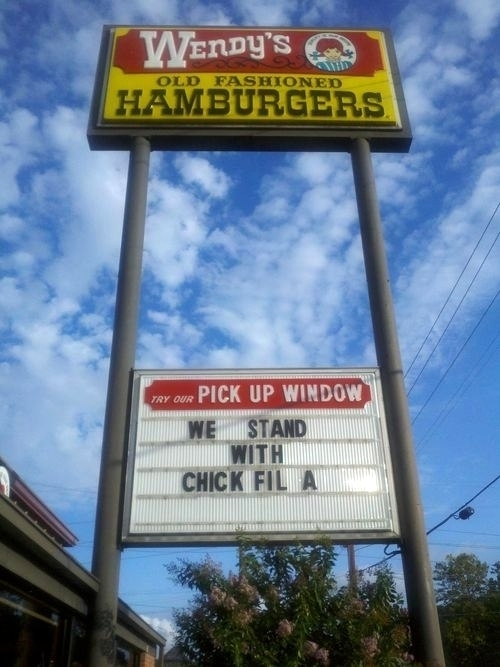 One sign in Columbia, South Carolina read 'We stand with Chick-fil-A' on Wednesday morning." There's another one, I don't know where it is, I wasn't told where it is. Let's see. "Today we recommend Chick-fil-A." Wendy's. I don't know where it is. Didn't say. But I tell you, it is huge, and it's fascinating. In a way, it's a giant Tea Party rally, and it's not being reported. It's as if a million-and-a-half people showed up on the mall for a Tea Party gathering, and the media, "Nah-nah-nah-nah, the Park Service says 10,000," and never showed any pictures of it. RUSH: I just got an on-the-spot, man on the street report from Cranbury Township, Pennsylvania. The Chick-fil-A there has everything shut down. And there are no TV trucks. There is no media. It's great to see. People are sending me the pictures and so forth, what's going on out there. And totally under the media radar, have no clue. Many of them probably have no idea why this is happening. Why would they be upset over what Rahm Emanuel said? What was so bad about that? RUSH: This is August 1st, folks. August 1st, 2012. It is our 24th anniversary here at the EIB Network, 24 years, starting our 25th year today of talking about and celebrating the wonder of America. 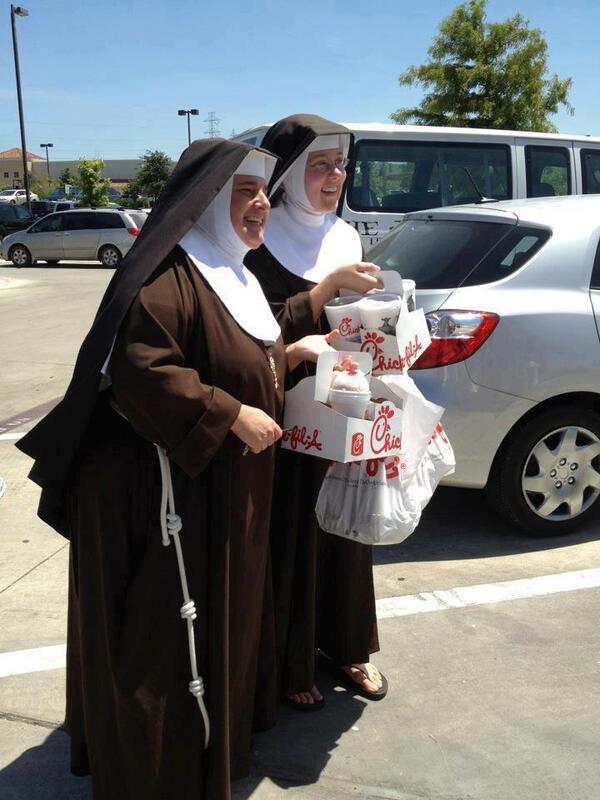 Also happening on August 1st, the Chick-fil-A revolution, supporting the right to voice your religious beliefs. That's what this is about. You have two Democrat mayors who essentially said, "Christians aren't desired in our towns." You can strip away, you know, Rahm Emanuel, Chicago values and all that, all this is about is the fact that the head honcho Chick-fil-A is an open Christian. He's out of the closet, and Rahm Emanuel said he's not welcome here, we don't want people like that, that's not Chicago. So Christians are told, don't come to Chicago, don't come to Boston. Well, guess what? This is how they say, up yours. This is how they say, in your face. So on August 1st, the Chick-fil-A revolution supporting the right to voice your religious beliefs and August 1st also the beginning of Obamacare mandating that religious institutions violate their religious beliefs by providing birth control and drugs that facilitate abortion against their religious beliefs. August 1st, what a profound day in history. RUSH: Well, Fox News just showed a helicopter shot of a line of cars in front of a Chick-fil-A. Did you miss it? They just showed it. It's the power of EIB. Just a little aside, just a little aside. Finally got a helicopter shot. RUSH: This is Barbara in Kansas City. It's great to have you on the program. Hello. CALLER: Hi, Rush. This is so exciting for me to be able to speak with you. My husband got me hooked on you during the Clinton administration, so for me this is such an honor. I've tried for years to get through and never could. RUSH: Well, I'm glad you did today. RUSH: I know where that is. Yeah, I used to drive by there wishing I had the money to go in. CALLER: I burst out laughing. It was packed. There was a line out the door that was unbelievable. Cars trying to get it from the Ward Parkway side, the state line side, the 86th Street side, from the Target parking lot. It was just hilarious. And I thought, this is so wonderful because there's been no media attention, and it's great that conservatives are able to get out there and say we have a voice. RUSH: There's no TV media? CALLER: No, there was no TV media. RUSH: Right, right. Because I know KMBZ is all over it.